Sophomore Suzette Rodriguez continued her decorated year as the Maple Leaf track and field team traveled to Indiana Wesleyan University for their first outdoor meet of the season. The Polar Bear Invitational hosted 18 schools in total on Saturday as it lived up to its name with temperatures dipping below 40 degrees at the start of the meet. Coming off a strong indoor season that led her to the national meet, Rodriguez posted a first-place finish in the hammer throw as she heaved a throw of 153 feet 11 inches. Rodriguez also placed 15th in the discus. Sophomore Jacob Gerber complimented Rodriguez’s title with a fifth-place finish of his own in the hammer throw. Gerber also placed 18th in the discuss. Sophomore Makayla Collier started her season off strong, taking home three top-10 finishes of her own, highlighted by a fourth place finish in the 400 meters with a time of 103.01. Collier grabbed eighth in the 100 and 10th in the 200 with times of 13.53 and 28.06, respectively. Junior Chelsea Foster returned to the track after a year sidelined by injuries, posting a 5:30.89 in the 1500 meter. Junior Megan Graber and first-year Hayley Bickford both achieved personal records in the same event. In the women’s 5000 meter run, junior Siana Emery finished in 20:36.01, a nearly 30 second all-time personal record. Arian Perez-Diener’s 21:01.19 was a collegiate best on the track. On the men’s side of the track, distance proved to be the Leafs strength as three runners between the 1500 meter and 5000 meter finished inside the top-10. Junior Vincent Kibunja led a pack of five Leafs in the 1500, placing fifth with a time of 4:06.22. Not far behind, sophomore Salvador Escamilla took ninth at a 4:12.16 pace. In the second longest event of the day, the 5000, junior distance runner Max Burkholder finished with a time of 15:51.78, a significant personal record and good enough for ninth place. 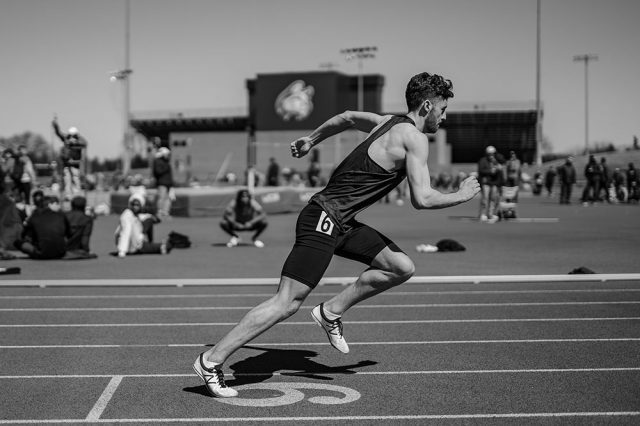 Junior Ollie Smith was a highlight from the sprinters, as he won his heat and finished 10th overall in the 400, posting a time of 52.23 in his final race. Next on the slate for the track and field team is a trip to Taylor University on Saturday, April 6 as they compete in the George Glass Invitational. Before that, however, the team will be hosting their annual intersquad meet this coming Friday, March 29. The event is free and open to anyone. Those interested should contact head coach Rustin Nyce at rustinwn@goshen.edu .